Here's a quick pic of my Legends. Hmm...I have more females than I thought. Some of them are headswap customs; I took Hope Summers' head and put it on Black Widow's body, Black Widow's head onto Moonstone's body, and put an older Black Widow head on to Hope's body. Aaaaaaaaand... I caved in and ordered the Hobgloblin set on eBay. Haha I figured the slight extra cost per set is worth my gas and time. I just too impatient. And that Hobgloblin looks amazing! Nothing in Utah, but I just got them in the mail. Spider-Woman, Spider-Girl, and Spider-Man 2099 especially are amazing. And I just found the Odin line in Utah at the end of last week. I was at a TRU in NC yesterday morning and was there when they opened a fresh case of the newest Spider-man wave. Picked up the main Spider-man figure (with pizza!) and Daredevil. Also, got Scarlett Witch from a fresh case, too! I am surprised this thread died down the way it did considering how consistent it was for like... ten days LOL. Bought my first set this week strongly because of Thanos. Figured it wouldn't be a bad thing to have the movieverse Avengers but of course now my addictive personality is annoyed that I don't have other movieverse characters that were released already and are now a tougher find. As well as characters that don't have movieverse versions out like Hawkeye and Ronan the Accuser. Anyways, any thoughts on what characters may come next? Last edited by doseljugo; April 12th, 2015 at 08:28 PM. Hawkeye had a figure in the Walmart exclusive Avengers series for the first movie, but that figure is getting re-released (with a new no-sunglasses head) in a Amazon exclusive 4-pack with Thor, Black Widow, and Bruce Banner. And I think there is going to be an Ant-Man ML, and the BAF for that series will be AoU Ultron Prime. I hope they make a spider-gwen figure . Been loving these scale figures ever since Spider-Man Classics. But the last few years hardly any stores in my area stock them, and when they do it is very sporadic (same with the DC Universe line). I was so happy when I stumbled on a couple of Odin wave figs back in Feb. Snagged Hawkeye and it was a month before that store restocked. I picked up everybody else (except Sentry don't want that one). But now, there are Odin wave figures everywhere. Probably just as a loose tie-in to Avengers: Age of Ultron. And oddly enough, TRU has a ton of SHIELD 3 packs but other than Coulson don't want it. As for the older waves, I really miss the detailing and display stands. But the women bodies were simply bad. And there are still several figs I want to track down: Wave 3 Namor, Wave 5 Nick Fury, Wave 14 Luke Cage, Wave 15 Destroyer (it has the only piece I need to finish MODOK and I'm not getting the stupid Iron Man armor variant. By now, I am also burned out on the whole build a figure gimmick. When it came to the Sentinel, Giant Man and Galactus it was cool. Now, with the recent X-men wave if you bought Storm you got Jubilee's entire body except head and arms so you had to buy 3 other figures. If they just released Jubilee I would have bought her. While I am not opposed to getting Strife I do not need yet another Wolverine. Loving the new Spider-Man wave. Wish I could find the new Thanos wave though..
Been waiting for thise 2099 Spidey since the original Classics KB one. Cant wait for new 90's Scarlet Spider, that guy was my favorite. I was torn and really wanting to get this new line for Thanos, but I need to spare my wallet a bit. Plus my Toy Biz Spider-Woman doesn't look too out of place with the other girls. I do second wanting Spider-Gwen! Ugh. I didn't know the 3 pack for Fury, Hill, and Coulson was on TRU. I need to see if they are still in stock (I'm in class right now and TRU.com is slow on my phone). News to me and loving it! Man, I really want that new basic Spidey. I saw three this past weekend, but they all had sloppy paint on the eyes (on both heads). I had to wait through finding about 5 until I found one that was acceptable. New Basic Spidey? I noticed there were 2 Spiderman figures on clearance at Walmart.com but one looks like the movie figure and the other like Miles Morales. I guess going through the site I am at risk of a bad paint job? Edit: And darn am I disappointed that there isn't another Ronan the Accuser released on its own. My GOTG figures look great together but they need their big baddie!!! Still want a bigger and better Ultron though. Last edited by doseljugo; April 15th, 2015 at 01:00 PM. Movie Ultron will be a BAF in another wave this year. Would NOW! Iron Man really sell when Superior is the hotness? THIS IS THE SERIES I NEED!!! I bought the few Odin wave figs I needed, and all of the Thanos and Mandoird wave. I now need that Hulkbuster or else my life is a failure. I need to get Iron Man 2 Mark V now. As well as some randoms from older previous waves. Notably, Archangel, Marvel's Hawkeye, Scarlet Spider (Kaine) and Miles Morales. 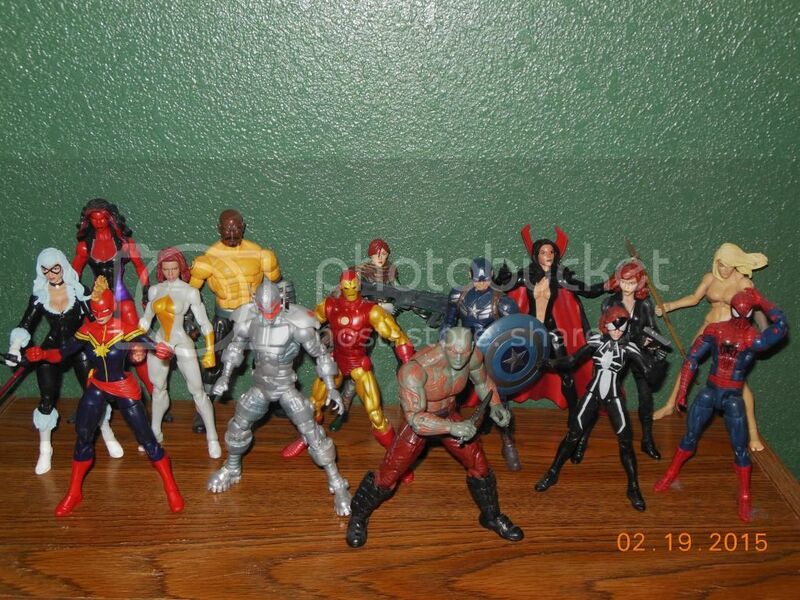 And Probably the entire Ant Man wave also so I can have Ultron! Now, some of my collection!